For the nine days of Winter Festival - January 19 through 27 - enjoy a $3 cup or $6 bowl of Winter Fest Soups at participating restaurants. Soup and restaurant information will be posted as it becomes available. Soup Lovers eat & vote for their top 3 favorite soups. Ridiculously delicious soup with authentic house made enchilada sauce blended with the perfect combination of chicken and cheese and served with house made tortilla chips. Ditalini pasta,cannellini beans and prosciutto, onion, and Italian parsley in a tomato broth with grated locatelli cheese. Gluten free no worries Request without pasta! All soups made at DiNapoli’s are from family recipes dating back to our Italian heritage! The Pasta w Fagioli is Grandmom DiNapoli’s recipe and would always have a pot simmering for all guests and family to enjoy. This soup was as favorite of the children and their friends growing up. The parents of the DiNapoli boys friends were always so thankful for their children eating healthy at the DiNapoli home! 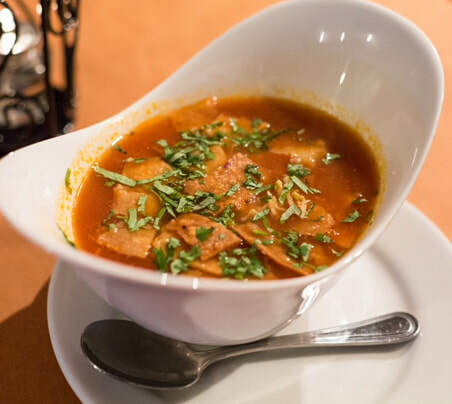 ​Among an immense selection of Peruvian soups, one boldly stands out from the rest. It is a combination of exquisite tastes and textures, originating from the Southern Coastal region of Peru. Shrimp chupe, or chupe de camarones, in Spanish, is an extremely satisfying, robust and some even say aphrodisical. Shrimp, rocoto pepper for flavor, potatoes, vegetables, and poached eggs with a touch of milk. Creamy vegetable chowder with North American farm-raised buffalo meatballs and cannellini beans. About the SoupA red based soup with a holy trinity of peppers, onions, and Louis sausage finished with a helping of seasoned pastini. An assortment of slow roasted mushrooms, cooked with our home-made mushroom stock, thyme, and dry sherry. This creamy deliciousness is garnished with garlic croutons. The definition of health and comfort, our Very Veggie Vegan Minestrone starts with my savory vegan signature stock followed by a hearty addition of fresh vegetables and beans including kale, carrots, green beans, kidney beans, petite peas, plum tomatoes and more. Tomato, basil, cheese and cream to die for!! Tomato based broth with shredded chicken & corn kernels. Garnished with queso fresco, cilantro, sliced avocado & crispy corn tortilla strips. Spicy soup with smoked chicken,sausage,wild rice and okra.